It has barely been over a month since 3 Bahadur — Pakistan’s first ever animated film — was released but the staggering success it achieved has propelled a new wave in Pakistani filmmaking and animation. The next offering is likely to come from Unicorn Black studios, the geniuses behind everyone’s favourite veiled super heroine, Burka Avenger. Head of the studio, Haroon Rashid has announced plans of taking the animated series he created to the big screen. Released back in 2013, Burka Avenger tells the story of a female vigilante of the fictional town of Halwapur, fighting criminals from behind a burqa so as to conceal her true identity. Using the special martial arts form of ‘Takht Kabaddi,’ Jiya throws books and pens at all those who attempt to harm her hometown and guards her people from various villains, like the evil magician Baba Bandook and corrupt politician Vadero Pajero. The Unicorn team is looking at “at least one year” to completion but with 52 episodes and four seasons worth of experience under their belt, Haroon is confident of their command over the animation craft. “We always wanted to make a movie, even after the very first season. But the show became so successful that a second season was commissioned and we started working on that,” he added. Regarding who would be helming this project, Haroon revealed that he would be continuing his job as the director on the silver screen as well. Having overseen the first three seasons, Haroon felt that he had developed a strong grip over the craft and it was only natural that he directed the movie as well. 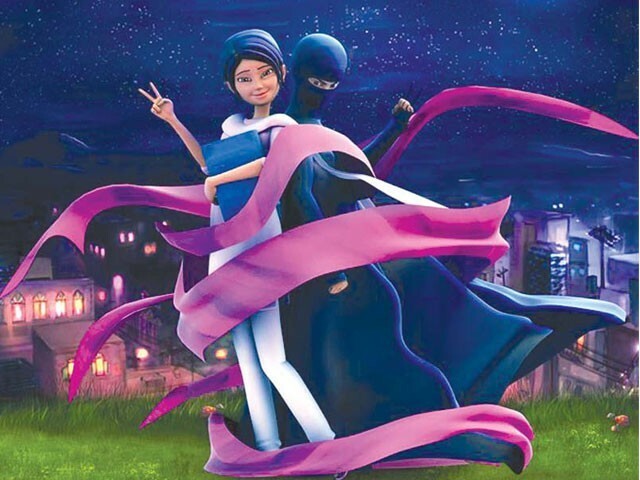 The news of the Burka Avenger movie coincides with the release of the series’ third season which has already garnered much appreciation for the social issues it highlights in every episode. Haroon shared that some of the topics include traffic obedience, gang culture and even the internet, as seen through the eyes of the two main antagonists. “This season is bigger and better than the previous ones in every sense, be it production [value], animation or the storyline,” said Haroon. “Even some of the fight sequences you will see this time around are brilliant.” He is particularly proud of a robot crow that his animators and modellers have managed to design this time. The Post-production on the fourth season has also been completed will be aired soon as the third one completes its run. Unicorn Black though is not the only animation studio gearing to release a film as earlier Waadi Animations and ARY Films had also spoken about their plans to release a follow-up to 3 Bahadur.